"Just wanted to let you know I got the angel and she is beautiful. Here's a chuckle for you. 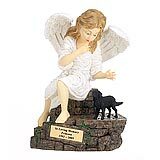 I liked it so much I made a comment to my boyfriend I wanted mind having the angel for my self. He said that I would have to lose a lot of weight first. Yes he got hit for that one. But she is very pretty. thank you and I'm glad you had her in stock. 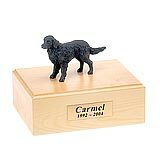 I'm glad I called you that night.. "
All available Flat Coated Retriever dog urns and memorials will be displayed with the figurine on the Flat Coated Retriever urn you select and in the appropriate size.